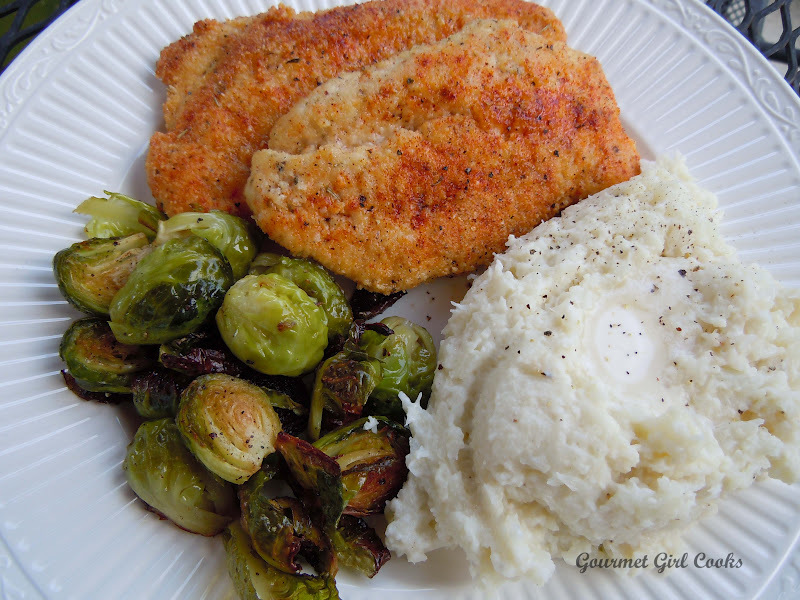 This evening I was in the mood for Italian Breaded Chicken Cutlets, mashed potatoes and roasted brussel sprouts...but since I am eliminating wheat and reducing carbs, I had to make a few modifications. I must say, my modified version of this meal was as tasty, if not more so, than the "regular" version. It also was a fantastic way to eat lots of fresh veggies. Our meal included fresh cauliflower, fresh brussel sprouts and fresh tomatoes and was absolutely delicious. To coat my boneless chicken cutlets, I mixed about 1 cup of almond flour/meal in a bowl and added about 1/4 cup of grated Parmesan cheese, a few shakes of sea salt, freshly ground black pepper, Italian seasoning, garlic powder and cayenne pepper. I combined it thoroughly. In a small bowl, I made my egg wash. I added some egg whites (Egg Beaters), black pepper, cayenne pepper and sea salt and beat well. I dipped my chicken cutlets into the egg wash and then coated well with the "almond breading" mixture and sauteed in a hot non stick skillet coated with olive oil until golden brown on both sides. While my chicken cutlets were cooking I cut up and cooked a large fresh head of cauliflower that I cut into florets and boiled/steamed in about 1 inch of lightly salted water for about 15-20 minutes until tender. When tender, I drained the water and put the pot of cooked cauliflower back on the stove over medium heat to further dry it out a bit, stirring occasionally. I then mashed it was a potato masher and added 1 tablespoon of a butter/olive oil blend, 2 tablespoons of reduced fat cream cheese, 1 tablespoon of sour cream, a few tablespoons of Parmesan cheese, sea salt, black pepper and a dash of garlic powder. This seasoned it and made it a bit creamier in texture, but not heavy. While the cauliflower and chicken were cooking, I halved some fresh brussel sprouts, drizzled with a little olive oil, sea salt and pepper and popped them into a 400 degree oven for about 20 minutes to roast. Since our tomatoes and basil are really coming in now, I diced several of them and tossed with a little olive oil, red wine vinegar, salt, pepper and fresh basil from our garden to make a fresh little side tomato salad to accompany our meal. The dinner was absolutely delicious. I snapped a few photos below. Enjoy! No wheat, no gluten and low carb...but 100% delicious -- who knew it could taste this good? 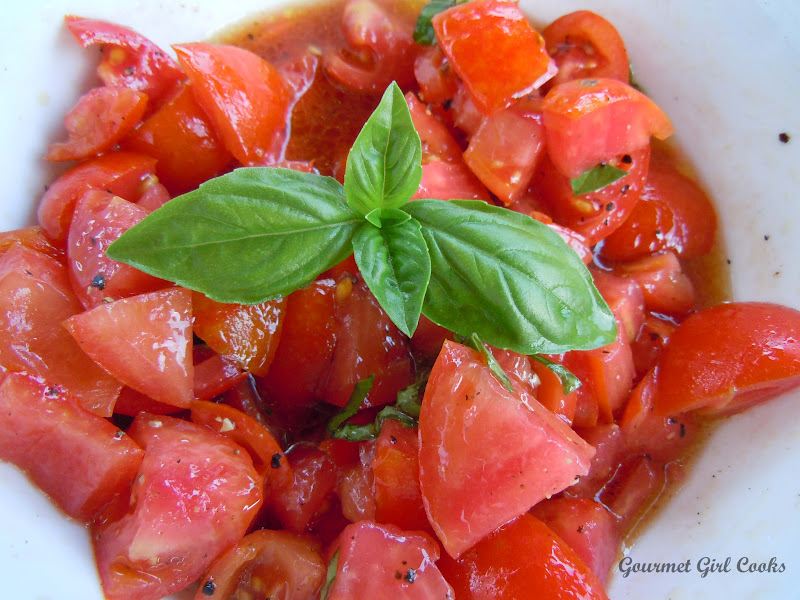 Fresh tomato-basil salad...courtesy of our garden! I think I need to come and live in your house. Would you mind? I am a new convert to cauliflower mash. It's delicious. This was really good and really easy. Thanks for all your yummy recipes! Haven't done me wrong yet. And you are hubby approved as well! I hope that you do not mind my questions: Why not cook the cauliflower in the Micro wave oven? You used reduced fat cream cheese in the cauliflower, I thought whole fat is better and has no carb? Hi Unter! No, I don't mind your questions at all -- and sorry it took me longer than usual to get back to you. You are correct, it IS better to use full fat products...reduced fat is probably what I had available at the time and I looked at the date I posted it (7-19-12) -- that was my 9th day on WB so I probably hadn't fully adopted the "full fat" concept after being brainwashed for so many years to fear fat. I use full fat when possible and for things like yogurt, I occasionally eat 2% -- but not because I'm afraid of fat any more! :-) Oh, P.S. -- you could cook the cauliflower in the microwave oven -- but recently I've been cooking it on the stove in chicken broth until it is all evaporated -- it gives lots of flavor to the cauliflower mash because it absorbs into the cauliflower and flavors it too. But, to save time, the microwave would work perfectly -- just drain the cauliflower well so it isn't soggy when it is mashed. Thanks!